A tough weekend came to a close Sunday afternoon for the Concordia men’s soccer team. 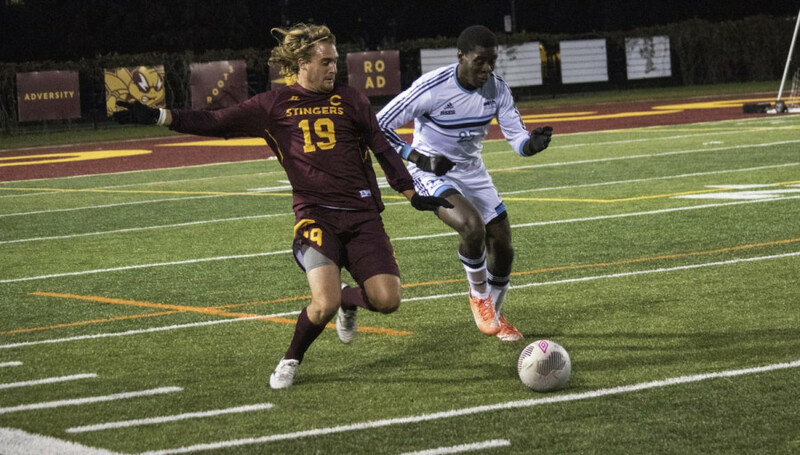 After dropping a tough 2-0 defeat to number one nationally ranked UQAM on Friday, Concordia fell to the Université de Montréal Carabins by the same score on Sunday afternoon. “We did a good job. We worked together and we got the two goals. I think we deserved it,” Carabins defender Francois Vanderberge said. The Stingers were looking to build off Friday night’s effort against the Citadins, but following Sunday’s loss, manager Greg Sutton called for more “consistent” play from his team. The Carabins defeated the Stingers 3-0 on Sept. 18, and picked up right where they left off on Sunday afternoon. After a mad scramble in the penalty area that saw the ball bounce around for what seemed forever, Antoine Noel finally struck the ball into the Stingers net to put the visitors up in the 20th minute. In the 43rd minute, after a dangerous cross came in from the left side of the field, defender Justin Gibson slid inside the six-yard box to make a clearance. Unfortunately for Gibson, the ball deflected off him and instead of going towards safety, the ball rolled into the back of the net. The own goal doubled the Carabins lead going into the break. “Goals like these happen, but they still count. You can’t do much about it,” goalkeeper Wes Aucoin said. He was named the Stingers’ MVP at the end of the game. The second half saw few chances for Concordia, who are struggling to find their scoring niche when it counts. Previously this year, they equaled their goal total from 2014 after only four games. However, all eight goals came in two wins, 4-0 over McGill and then 4-1 over Sherbrooke. In all five losses this season, they have been shutout. “Our strikers can only do so much. We need to get support from our midfield. If we sit too deep and don’t create opportunities through our midfield then they [the forwards] will be stranded on an island up there,” Sutton said. Playoffs are still a very realistic goal for the Stingers despite their 2-5 record. This Friday they will undergo a major test when they visit cross-town rival McGill. Both teams sit tied for fifth, and are only three points behind Laval who occupy the last playoff spot. Concordia opened the season with a resounding win over the Redmen but know they will face a motivated team when they kickoff at 8:30 p.m. at Percival-Molson Stadium.